Release Note | Nyahoon Games Pte. Ltd. Fix the problem that “Cleanup leaked objects…” is shown when a scene is saved. Remove FogMacro.cginc file from the package for Unity 5. Shadow Receiver and Projector Manager now call “UpdateTransform()” method before using transform of a projector, if any components of the projector object have such public method. Fixed a bug of Easy Setup Wizard whereby a MeshShadowReceiver was created with null material. Fixed a null pointer exception which could happen when building a mesh tree. Added some error check in Inspector View. No longer support Unity older than 4.6.2. Fixed some Unity 5 compatibility issues with Demo. There was a little chance that recast agains BinaryMeshTree could return non-closest point. 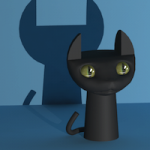 It is now possible to setup MeshShadowRenderer at runtime. It is not required to set some MeshTree and Mesh Transform in Editor. Fixed some issues which might have happened when trying to build MeshTree at runtime. Thread-safe raycast against a MeshTree (See Multithreaded Raycast Demo). Fixed some Unity 5 compatibility issues. Fixed the issue that MeshShadowReceiver did not work correctly if the mesh model was scaled. Fixed the issue that near clip and far clip of a Light Projector was affected by the directional light position. Light Projection support (SpotLight + Fake Shadows Demo). Draw Gizmos when shadow receiver is selected. Normal vectors are now available in shadow shaders. Added back face culling option to MeshShadowReceiver. New projector shadow shaders which can avoid backside projection problem.